The eSports industry has seen tremendous growth over the years both in terms of viewership and revenue. The increasing viewership is what mainly contributed to the revenue growth – and it’s not just because those viewers are generating revenue. Brands, seeing the potential of reaching a large and engaged audience, are investing in eSports marketing both directly and indirectly. That’s what has mainly contributed to the rapid revenue growth in the industry. eSports is also experiencing growth in several other aspects, with a lot of them being interrelated in one way or another. 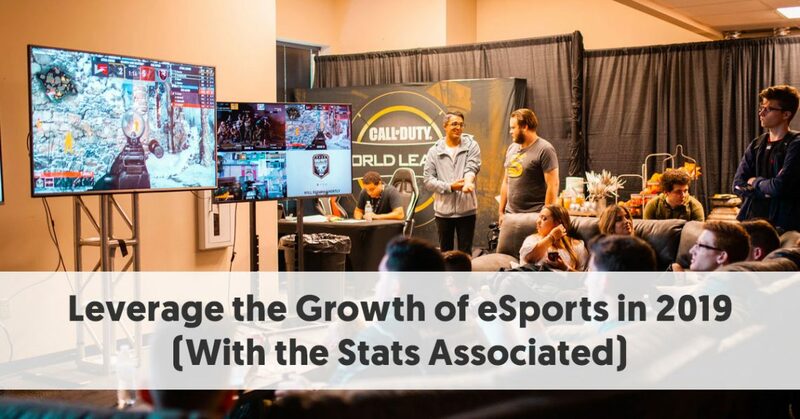 In this post, you will learn more about just how much the eSports industry is growing so you can understand how to leverage it. Since 2016, there has been a significant increase in eSports viewers – both occasional viewers and enthusiasts i.e. viewers who watch it regularly. Between 2016 and 2017, there was a 19.3% increase year over year. In 2017, there were 192 million casual viewers and 143 million enthusiasts, making the total audience 335 million. In 2018, the year-over-year growth rate had slightly dropped at 13.8% although that’s still a sizeable increase. In 2018, there were 215 million occasional viewers and 165 million enthusiasts. So the total audience size grew to 380 million. By 2021, Newzoo predicts that the annual growth rate will be approximately 14%. They also predict that the number of casual viewers will grow to 307 million. And that there will be 250 million eSports enthusiasts, making the total audience 557 million. 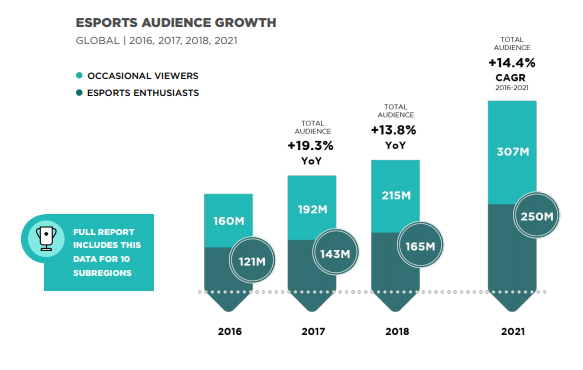 So you can see that there has been steady growth in eSports viewership and the trend is likely to continue in the coming years. The increase isn’t just limited to dedicated eSports fans; there seems to also be an increase in people who are viewing it casually. This is likely a result of increasing awareness about eSports and ease of access to the internet. Besides, viewing platforms like Twitch and YouTube also see growth in their users. That’s another contributing factor to eSports audience growth. You will learn more about these factors later on in this post. One of the main reasons why there has been growth in eSports viewership is because more people are learning about it. There has been a tremendous rise in awareness of the eSports industry since 2015. Back then, there were slightly more than 800,000 people who had heard about it. These numbers soon changed, and by the next year, more than a billion people had learnt about eSports. These numbers continued to increase in the following years, by a few hundred thousand annually. By 2017, eSports awareness had risen to 1.28 billion, and it reached 1.43 billion by 2018. In 2019, an estimated 1.57 billion people are likely to learn about it. This means that viewership will likely increase as well and with that, the industry will further see revenue growth. So what does this increase in viewership and awareness mean for brands? For the most part, it says that they have a new channel to target in their marketing mix. It also says that they have more people to reach within the eSports industry. So eSports marketing will help them expand their reach and deliver their marketing messages through engaging channels. It’s no surprise that more people are watching eSports videos and events considering how online platforms are simplifying eSports content consumption. eSports streamers use these platforms to broadcast live coverage of events and their own gameplay. This makes it easier for fans to participate in their favourite events and engage with their favourite eSports athletes. So you can see an increase in the number of viewers and broadcasters on these platforms as well. Although not all the viewers and broadcasters on these platforms are relevant to the eSports industry, this increase still likely affects the industry as well. Twitch and YouTube lead the race with 1.13 million active streamers and 432,000 active streamers per quarter respectively, according to a Streamlabs analysis. Twitch has also seen a steady increase in the number of people who view live streams through the platform. While there were about 591,809 average concurrent viewers in 2016, the number is expected to increase to 1.28 million in 2019 according to TwitchTracker. TwitchTracker also reported that the average monthly unique broadcasters on the platform grew by 70% in 2018. This year, there has been a 36% increase in monthly streamers so far with 4.6 million streaming on the platform each month. And the top Twitch streamer has more than 51,000 subscribers. The platform has also seen a steady increase in the number of channels simultaneously broadcasting live. This number increased by 67% in 2018 with 41,100 average concurrent live channels. In 2019, the increase so far has been 37%, with 56,700 average concurrent live channels. So there is a ton of activity on these platforms, signifying that eSports fans are highly active and engaged with relevant content. One of the most drastic differences over the years is in the amount of time spent watching eSports videos. As more people are consuming eSports content, the hours spent watching eSports videos is also increasing every year. In 2012, people were spending only about 1.3 billion hours watching these videos. This changed slightly and increased to 2.4 billion hours in 2013. By 2018, the increase was drastic as the number of viewers had also grown to 380 million. Last year, people watched 6.6 billion hours of eSports videos worldwide. This means that the hours spent watching eSports videos increased by about 1 billion hours each year. Since consumers spend so much time on eSports, this means that brands need to meet them where they’re at by adopting eSports marketing. This could be through ads, reviews, product positioning, influencer marketing, and more. Realising the potential of tapping into the eSports market, some brands have already made significant investments into eSports marketing. So the industry saw an impressive increase in revenue in the past years. According to the previously cited Newzoo analysis, there has been an average revenue increase of more than 30% annually. And a large portion of it resulted from brand contributions. In 2016, the total eSports revenue was $493 million, out of which $350 million came from brand investments. This increased by 33% year over year in 2017, where the total revenue was $655 million, and brand investments contributed to $468 million of this. In 2018, the average year-on-year increase in total revenue was at an impressive 38.2%. The eSports industry made a total of $906 million in revenue. Out of this, $694 million came from brand investments – both direct and indirect. That’s a 48% increase in brand investment from the previous year. 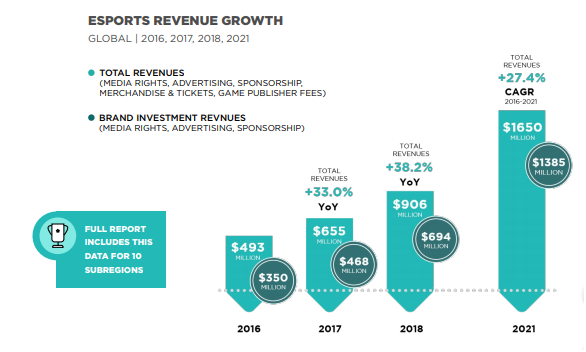 Newzoo predicts that by 2021, eSports will generate more than $1.6 billion in total revenue with $1.3 billion coming from brand investments. 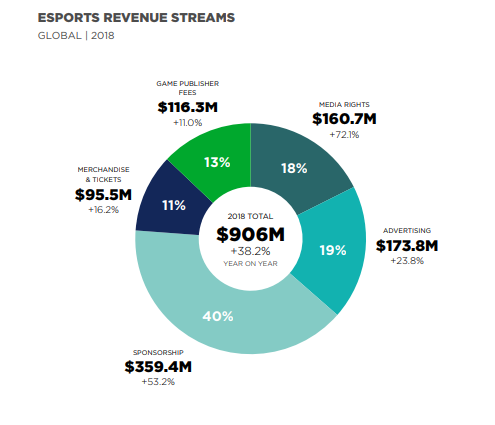 From the total eSports revenue in 2018, 77% came from direct and indirect investments by endemic and non-endemic brands. Direct investments include sponsorships and advertising. Indirect investments include media rights and content licenses. Sponsorships made up the largest contribution at 40% of the total revenue. Advertising came in next by contributing 19% of the total revenue, followed by media rights at 18%. eSports also generated 13% of its revenue from game publisher fees and 11% from merchandising and tickets. What’s interesting is that media rights as a revenue source are growing the fastest, at a compound annual growth rate of 49.8% between 2016 and 2021. So by 2012, Newzoo predicts that revenue from media rights will more than double and become the second biggest contributor to eSports revenue. Meanwhile, game publisher fees will grow the slowest at a compound annual growth rate of 3.5% between 2016 and 2021. Newzoo estimates that, although it saw some growth in 2018, earnings will drop by 2020 and 2021. So it will become the smallest source of revenue in eSports. There’s little doubt that with so much growth in all of these aspects, there will also be growth in actual eSports tournaments in terms of prize money and player earnings. In 2017, the total prize money for 4166 tournaments was more than $1.1 billion. So the mean tournament prize pool was around $27,500. With 17,921 active players at these tournaments, it meant that the mean earnings for each player were $6,407.98. There was a decrease in the total number of tournaments in 2018 with a total of 3489 tournaments organised. However, the total prize money increased to more than $1.5 billion. So the mean tournament prize pool almost doubled at approximately $44,000. Even the median earnings per player increased in spite of an increase in the total active players. 18,832 players played at these tournaments with a median-earnings-per-player of $8,278.68. The top eSports team earned more than $24 million in prize money by playing 1430 tournaments. These numbers show that there’s a lot more money in eSports tournaments than before and you can expect to see an even bigger increase in 2019. These stats clearly showcase the rapid growth of eSports and the possibility of continued growth even in the coming years. In 2019, it’s crucial for brands to start tapping into this market before it becomes saturated with brands trying to monetise the popularity of eSports. You could sponsor teams at tournaments or buy an ad. Perhaps you could also partner with influencers in the industry and have them promote your brand or review your products. There are tons of opportunities you can seize to ride the wave of eSports’ popularity.